ところでミクロバス・シリーズ最初の3作品すべてをお買い上げいただいたコレクター１名様に、抽選であやさん描き下ろしのヘッダーカード用原画が当たるっていう話、忘れてませんよね。 The third edition in the series is the essence of Aya Kakeda's image, and is created through hand-coating, without the use of a spray mask at all. The skill of the Obitsu Plastic Manufacturing Company's workers shines. Furthermore, GID sofbi is used, which shimmers even in darkness. As always, there are 30 edition size products. It goes on sale at 11 AM on Valentine's Day, February 14th (JST). To purchase it, please click the URL below. Don't forget that we plan to gift the original artwork of header card by drawing a lot to select 1 collector out of those who have bought all of the first 3 works ("To The Mystic Mushroom Forest", "To The Yeti Mountain" and "To The Candy Kaijyu Planet") of the Microbus series. 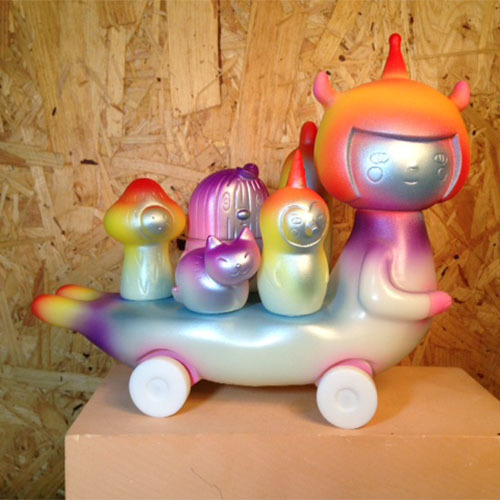 Microbus the second colorway was named "To The Candy Kaijyu Planet"
ところでミクロバス・シリーズ最初の3作品すべてをお買い上げいただいたコレクター１名様に、抽選であやさん描き下ろしのヘッダーカード用原画が当たるっていう話、生きてますから。 We are planning to release Aya's "To The Candy Kaijyu Planet" in early February.